One of the greatest aircraft of history, the Junkers Ju 52 was designed by Ernst Zindel. The prototype first flew in October 1930. As a civilian airliner with a capacity of 15–17 passengers, the Ju 52 sold all over the world and made up 75 percent of the large fleet of Lufthansa before World War II. The aircraft was eventually operated by twenty-eight airlines. Meanwhile the Luftwaffe, still embryonic and clandestine, was evaluating the military capabilities of the airliner. 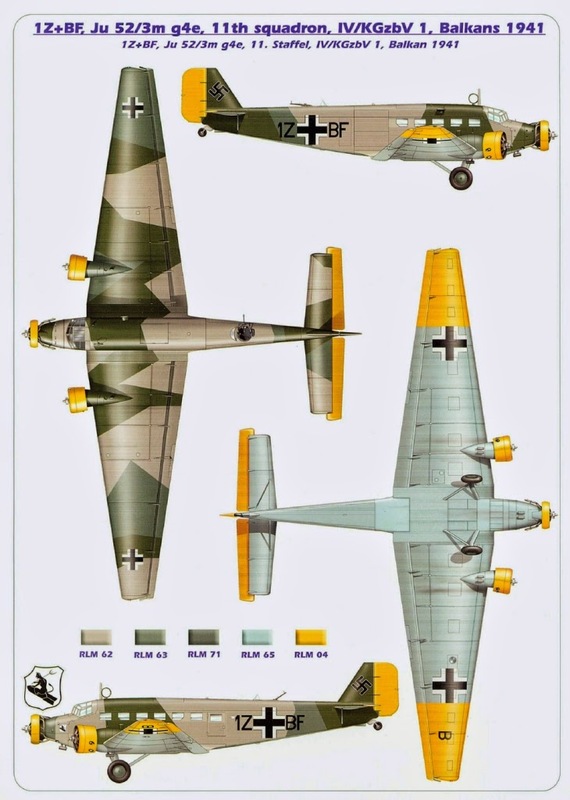 The Ju 52 entered service in the newly formed Luftwaffe in 1935 as an interim bomber with a 1,500-kg (3,307-lb) bomb load, and was employed as such during the Spanish Civil War. Soon the aircraft was discarded as a bomber and replaced by the Dornier Do 17 and Junkers Ju 86. It then started a long-lived and tremendous career as a military transport aircraft. It was a typical low-winged Junkers design with no concessions to elegance. It was operated by a crew of three; pilot and copilot/observer sat side by side and a radio operator/dorsal gunner sat on a jump seat between them. The cockpit was raised above the cabin floor height. When fitted with seats, the Ju 52 could carry up to eighteen passengers sitting in a rather spartan interior. When arranged as an ambulance, the seats were removed and the aircraft (often overpainted in white with large red crosses) could carry twelve seriously wounded on stretchers, which were fitted with harnesses used to tie them securely for rough take-off and landing. 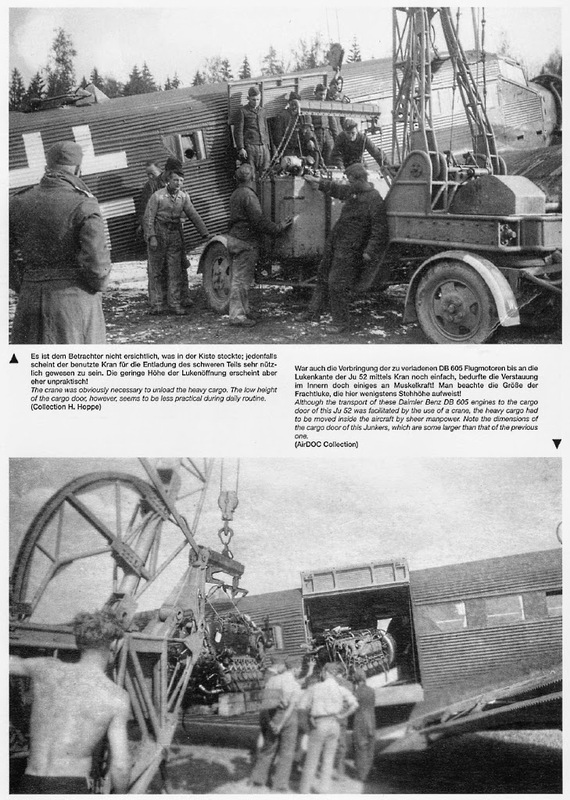 On nearly all wartime versions ( Ju 52/3m), power was provided by three 830- hp BMW 132T 9-cylinder radial engines, one in the nose, one on each wing; the wing engines faced slightly outward to reduce yaw should one of them fail. The exhaust gas was collected by annular ducts which gave the Ju 52 its trademark stains. Typical speed was 305 km/h (190 mph) and typical range was 1,300 km (808 miles). Length was 18.9 m (62 ft), span was 29.25 m (95 ft 11.5 in), height was 4.5 m (14 ft 9 in), and empty weight was 5,600 kg (12,346 lbs). The aircraft had a payload of 1,102 pounds. It could transport, for example, twelve fully equipped paratroopers, plus four weapons and ammunitions canisters, or ten oil drums of two hundred liters each. The Ju 52 was usually not armed, but in combat zones it could mount one 13-mm MG 131 manually aimed from an open dorsal hatch, and two 7.92-mm MG 15 guns manually aimed from beam windows. This distinctive and rather ugly trimotor machine had a strong fixed landing gear to cope with repeated landings on rough airfields; spats were issued to reduce drag of the wheels, but these were often dismounted due to clogging up in muddy conditions. The corrugated metal fuselage was a common feature of many Junkers design; that skin was load-bearing and the corrugation gave it considerable strength, for little weight penalty. The Ju 52 was used in all theaters in a wide variety of roles, including bomber, reconnaissance craft, troop and freight transport, ambulance, ski or floatplane, glider tug, and others. There was also a magnetic mine-buster version equipped with a magnetic ring fifteen meters in diameter, and a 12-cylinder, Mercedes- Benz-Nurburg, gasoline-driven dynamo producing a constant 300 amps current used to explode magnetic mines at sea. 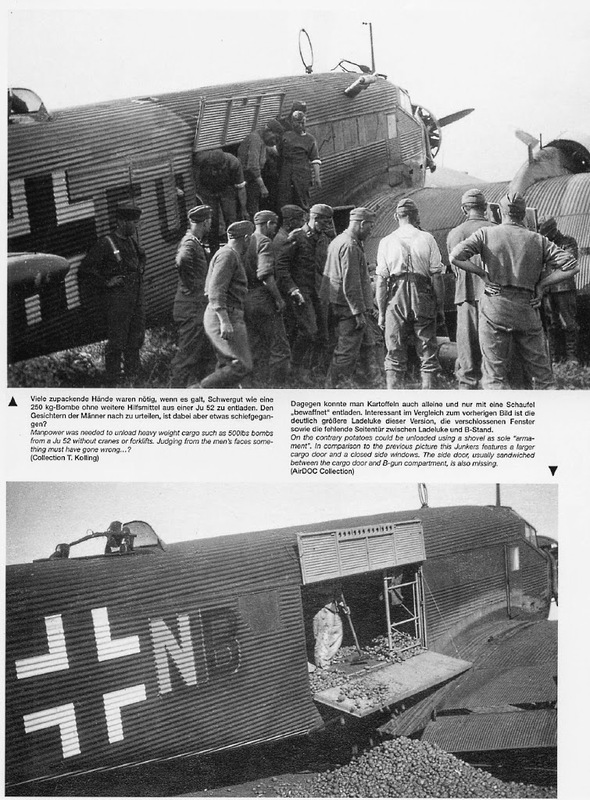 The Ju 52 was at the forefront in all German airborne operations in Norway, Holland, Belgium and Crete, as well as in the three major Luftwaffe airlift operations of World War II: Demyansk, Stalingrad and Tunisia. As the war lengthened, demands on the venerable type increased as its losses rose, presenting the Luftwaffe with a major headache, as availability always fell below requirements. As a general workhorse, the Ju 52 was invaluable: it was cheap to manufacture, simple to operate, and easy to maintain on the field, it could fly with one of its three engine out of commission, had the ability to withstand crash landings with reasonable safety to occupants owing to the ruggedness of construction. It had good STOL (short take-off and landing) performance, robust construction, interchangeable wheel/ ski/float landing gear, and great reliability, but it left a good deal to be desired as a transport airplane. Deservedly famous as a German counterpart to the U.S. DC-3 Dakota, the Ju 52 was obsolete by 1939, but continued to serve on all fronts until the end of World War II. It is typical of the Nazi regime that, despite a wealth of later and more capable replacements, the obsolete Ju 52 was kept in production throughout the war. Perhaps the ubiquity and the all-purpose nature of the highly popular Tante Ju (Auntie Ju) or Iron Annie—as it was nicknamed—tended to preclude the need for replacement designs. Also, there were many of this type on hand at the beginning of the war, engines were widely available, many pilots had been trained to it, and manufacturing facilities were already set up. The Ju 52 was manufactured by Junkers, but also by the French Felix Amiot Company located at Colombes near Paris, and by the Hungarian PIRT factory at Budapest. A total of 4,845 were produced by the Germans between 1939 and 1944. After the war, although totally old-fashioned and obsolete, production of the Ju 52 continued in France by the Amiot aircraft company, and some 400 units (known as Amiot AAC 1) served to drop paratroopers and transport freight for the French army during the early years of the Indochina War (1946–1954). The Ju 52 (designated CASA 352) was also produced for the Spanish air force as multi-role transport until 1975.